In just eight months, a tiny startup reached millions of users and landed clients like the Dallas Cowboys, NBA.com, indie-rock darlings The Lumineers and pop-star Enrique Iglesias. Tint, may only be a team of four, but they’ve been busy. The goal is to increase fan interaction by displaying their tweets, posts and photos on a grand scale. Tint allows businesses and brands to display social feeds on a website, mobile app, or even a jumbotron. Indie-rock band, The Lumineers are using Tint as part of their Keep Your Head Up twitter contest. The band’s social media team monitors fan tweets, filters through them, and displays their favorites on The Lumineers’ website for thousands and thousands of fellow fans to see. 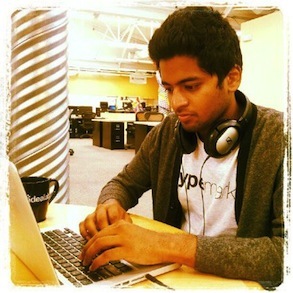 “Our goal is to increase fan interaction drastically,” says CTO Nik Aitharaju (pictured above). Nik reports that on average,Tint users see a 50% growth in interaction after adopting the service. With 12,000 active brands and businesses on Tint, traffic is increasing rapidly. When NBA.com integrated Tint into the website, Nik and his co-workers were all looking at their Google Analytics when they saw a giant spike in traffic. “It was very validating. We said, ‘Well, let’s go after bigger brands.’” And they did. The Dallas Cowboys now use Tint to broadcast fans’ photos on the jumbotron in Cowboy Stadium. But with big clients, come big responsibilities. Nik and his co-workers are currently working on launching geo-targeted social displays for restaurants, and retail companies, as well as other Twilio integrations. To learn more about Tint, visit their website here.